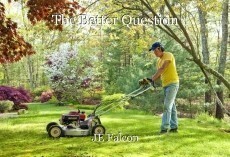 Summer questions about mowing grass, rhyming and tong in cheek. Should I mow every week, or twice a month? Or should I mow when I see the need? Or just mow when the mood strikes my fancy? After all, it's not like I took some mower's oath. That is a question of which I tire. Which gardener should I hire? A question I am very familiar with too, JE. Good poem. This page was created in 0.3013 seconds.